In Uruguay, infrastructure investment has traditionally been structured through public work concessions or financed through standard collateral secured loans, with occasional large-scale finance fostered by development banks, international financing institutions and export credit agencies. During the past seven years, however, it has received an increased flow of direct foreign investment. A large number of projects with expected high cash flow have been taking place in non-traditional industries such as oil exploration, wind farms, photovoltaic farms and infrastructure. Additionally, new projects are being developed under the Public-Private Partnership Law No. 18,786 of 8 August 2011 (the PPP Law), which allows the participation of private enterprises in the early stages of a project, and allows them to make contributions and changes to the project. This Law only deals with private sector and government joint ventures in certain areas – mainly infrastructure works (roads and railways) energy infrastructure and social investment (prisons, health centres, hospitals and education centres). The Large-Scale Mining Law (the LSM Law) was approved in September 2013, regulating this specific kind of mining activity for the first time and setting forth the contents of the mining exploitation agreements between, and to be signed by, miners and the executive; these agreements also regulate the assignment of exploitation rights as security in favour of the financing parties. Large investment projects are expected to take place in the years ahead, especially in the energy and infrastructure areas. Uruguay has been diversifying its energy matrix and although most solar and wind plants have already been financed and are under construction, new projects include electricity transmission lines and international connecting systems with Brazil. In 2017, the government closed a deal with a private developer for the construction of more than 200km of a new transmission line to connect the Melo converter with the Tacuarembó substation. This was structured under an operation lease and construction is about to begin. New bids for additional construction of transmission lines have recently been opened. During 2015 and 2016, renewable energy projects (wind farms and solar farms mainly) drew increasing flows of project finance with the participation of international banks, multilateral agencies, development banks and equity investors. There is high expectation for the memorandum of understanding (MOU) signed between the government and UPM, the Finnish pulp and paper maker, on November 2017 for the installation of a second pulp mill, a project with estimated costs totalling US$6 billion. Under this MOU, UPM required the government's commitment to update the country's infrastructure, in particular the railway system. Consequently, a call for bid for the construction of approximately 290km of a new railway (the Central Railway Project) is currently ongoing. The government and the private sector are still working to ensure that the PPP Law fosters large projects. Several PPP projects are currently under way, mainly for roads and schools. The mining industry has seen less activity; the government failed to reach an agreement with the private sector regarding the first mining exploitation agreement to be governed by the LSM Law. Regarding oil and gas, a new bid for onshore exploration (known as Ronda Uruguay III) has been launched by the government. Traditionally, projects are structured through public work concessions or financed through standard collateral secured loans. Physical assets owned by the project company are provided as collateral. Other standard models such as build-own-operate-transfer (BOOT), build-operate-transfer and build-operate-lease are not frequently seen since project companies often own the assets and may or may not provide a service. This was the case, for example, with a pulp mill construction project, where no public services were to be provided. Financing was secured by mortgages on the real estate properties where the mill was to be contracted and pledges on each of the spare parts to be used to build the plant. Further, supply agreements with raw material suppliers were executed and simultaneously conditional assignment agreements of the supply agreements were granted in favour of lenders. The aim was to place lenders in such a situation that, in the event of foreclosure, the whole project could somehow be sold or offered to a new developer. Wind and solar farm projects, as well as construction lines, are also being structured under project finance methods, using direct and indirect agreements, and operation and maintenance agreements. In other scenarios, the developer promises to pledge the wind generators once they have been constructed and the property transferred to the developer; and mortgages the land or executes conditional lease assignment agreements. In the past, the Uruguayan state and companies developing large projects have entered into investment agreements covering different project areas, from tax benefits to transport, permits, etc. Agreements of this type are usually executed under Law No. 16,906 and Decree No. 455/007, which refer to the investment promotion regime. It is not clear whether Law No. 16,906 validates the full scope and obligations that these agreements may include; however, some or all obligations may nevertheless be valid. Commercial risk: in past deals, sponsors' guarantees and share retention agreements have been requested. Operational risk: monitoring agreements have been used in, for example, toll road projects. Political risk: this is a low risk since Uruguay has been a stable democracy for most of the 20th century (interrupted only by a military government from 1973 to 1985) and has no recent record of creeping expropriation. Insurance may be requested to mitigate this risk.2 Lobbying has occasionally occurred to obtain investment treaties addressing these matters. Inflation and exchange rate risk: although exchange rate fluctuations occur, this risk can be mitigated by the fact that many agreements (including supply agreements) and loans can be agreed on any foreign currency. Sale of collateral in the event of foreclosure can also be carried out in a foreign currency. US dollars are widely used for all transactions, even in the power purchase agreements (PPAs) signed by renewable generators with UTE and the operation leasing arrangements entered into by UTE with private constructors. Environmental risk: these are usually offset by providing an environmental impact assessment (EIA) and requesting compliance with not only local environmental laws, but also international standards in the relevant industry. Under Uruguayan law, actual damages and lost profits may be recovered. Under contract law, the victim may also recover all other damages that a negligent breaching party could have foreseen, and if the breaching party acted intentionally, the victim may also recover unforeseen damages. The concept of damages includes patrimonial and extra-patrimonial damages and a defendant is liable for the harmful results that have been caused by its acts. If no harm is caused by the negligent act, it is not liable. Recently, the courts have changed their stance and have granted moral damages to legal entities (such as companies). Prior to this, moral damages were only granted to individuals. The general liability system of the Civil Code (CC) allows parties to arrange exemption from or limitation of liability, although restrictions apply in cases of wilful and grossly negligent behaviour, in which it is understood that no limitation may apply. Gross negligence implies any verified breach of contract that, because of the extremely careless manner in which it happened, cannot be excused. 'Extremely careless manner' implies neither preventing nor considering that which any other party would have prevented or considered: in other words, failing to take the most obvious or evident actions, or failing to act in the most basic way necessary, to prevent the damage. Further, under the CC regime, force majeure is always a justified cause for non-compliance and works for both parties to a transaction. The state does not usually grant guarantees or letters of comfort for private entrepreneurs. However, Uruguay has ratified investment treaties with certain countries (e.g., the United States and Finland) that comply in terms of arbitration and compensation for damage caused to investors. Recently, an investment promotion and protection treaty was signed with India, under which investments in Uruguay by Indian nationals shall not be nationalised or expropriated (directly or indirectly) except for public purposes and pursuant to non-discriminatory laws, and in which case fair compensation (i.e., the market value of the expropriated investment) shall be paid immediately. Property rights are expressly recognised in the Constitution for both nationals and foreign nationals. Furthermore, specific procedures are legally set out for expropriation, which establish that fair and due compensation has to be paid by the state to the former owner in all cases. MIGA has also participated in projects in Uruguay, providing guarantees, most recently in 2007, regarding the construction of a pulp mill project. The LSM Law states, particularly in relation to the mining industry, that exploitation agreements signed with the executive may be renegotiated should the public administration change the cost-benefit parameters in force at the time of execution of the agreement (invoking national interest and provided certain conditions are met). A common form of security required is collateral on the various assets of a project, since floating charges on the overall assets of an entity are not accepted. The PPP Law authorises the contractor to institute pledges over the cash flows generated by the PPP project, as well as to institute guarantee trusts, and all other real or personal guarantees over the goods and rights – whether existing or future – in favour of creditors (other than the administration), for the execution of the PPP contract. It expressly allows for a pledge over the rights originated under the PPP contract (concession pledge), but this is limited to obligations assumed with third parties for the financing of the operation or maintenance of the projects, as well as those resulting from a trust created for this purpose. Bank accounts: a pledge or a registrable pledge can be created. For the pledge, the agreement must be made in writing, signed by the title-holders of the account and the creditor and notified to the bank; dispossession of the funds of the account may be effective or symbolic. In the case of the registrable pledge, the agreement must be made in writing, signed by the title-holders of the account, and the creditor and signatures must be certified by a notary public. The registration is made by the applicable national registry granting priority over any other security perfected thereinafter and enforceable against all third parties (this applies to all registrable pledges, regardless of the assets being pledged). Equipment: this can be created by a pledge or a registrable pledge depending on the interests of debtor and creditor. In both cases, the agreement must be made in writing, signed by debtor and creditor. For the pledge, dispossession of the equipment from the debtor to the creditor (or third party) must take place. For the registrable pledge, the debtor maintains possession of the equipment. Real estate: a mortgage may be created. A public deed must be signed by debtor and creditor before a notary public and registration thereof is made with the corresponding public registry granting priority over any other security perfected thereinafter and enforceable against all third parties. The same applies to mining exploitation permits. Receivables: either an assignment of contract rights as security, or a registrable pledge can be created. In the first case, an agreement must be made in writing, signed by assignor and assignee and the document (title) of the credit must be handed to the assignee. The parties must notify the obligor for payment to be made to the assignee. In the second case, an agreement must be made in writing, signatures must be certified by a notary public, and registry (file) of the agreement must be made in the corresponding public registry. For example, under the current PPA template signed by renewable generators, assignment of the agreement and its credit is already covered. Shares (in book-entry and certificate form and other securities): a pledge can be created over shares held in certificate form. An agreement must be made in writing between debtor and creditor and dispossession of the shares from the debtor to the creditor or to a third party (depositor) must occur. If the shares or securities are held in book-entry form, a registered pledge applies. An agreement must be made in writing between debtor and creditor. Registry of the agreement must be made before the entity that holds book entry of said shares or securities, which will make the proper note in the book. Under Uruguayan law, a lender is not entitled to exercise self-help remedies (a court order is mandatory) and, in principle, step-in rights in favour of creditors without court process are not provided for in Uruguay. The PPP Law, however, expressly states that in cases of early termination of the PPP contract upon default of the contractor or abandonment, the administration may step in for no more than 24 months, to guarantee continuity of services. Upon expiration of this term, it must be resolved whether the administration will continue to render the services or whether a private entity will take over, using the mechanisms set out in the PPP Law. The LSM Law, in turn, states that clauses may be included in the exploitation agreement signed with the executive regulating the assignment of the exploitation permit to financing parties as security so that said financing parties may assign it in turn to a third party with the executive's prior authorisation (to be granted if that third party complies with the legal requisites to be a holder of the mining exploitation permit). As far as bonds are concerned, their use in construction contracts and project finance transaction is not widespread. Standby letters of credit are not regulated under Uruguayan law. However, they are considered independent obligations of the issuing bank and are frequently used as a form of payment guarantee in the event of non-performance by the applicant of a contractual or other obligation with the beneficiary. The most common bonds are bid bonds and performance bonds. Bank guarantees are similar to standby letters of credit, the main difference being that they are regulated by local laws and regulations. They are also issued to cover an underlying transaction or contractual obligation. The most common guarantees are customs guarantees, lease guarantees and bid guarantees. To engage in insurance business in Uruguay – for national or foreign individuals or legal entities and for any risk located in Uruguay – it is necessary to establish a corporation with registered shares (which may belong entirely to a foreign insurance company), having as its sole purpose insurance or reinsurance activities, and it must be authorised by the executive on the advice of the Superintendency of Insurance and Reinsurance within the Central Bank of Uruguay. Further, foreign reinsurance companies that want to operate in Uruguay must have a risk rating equal or superior to A- determined by a risk rating agency selected from the entities established by the Superintendency of Financial Services. Similarities in the judicial enforcement of pledges, registrable pledges and mortgages have been reinforced with the recent amendment to the General Procedure Code brought about by Law No. 19,090. These proceedings begin with the filing of the creditor's enforcement plea furnished with the corresponding title and usually requesting attachment (embargo). Once the attachment is in place, the debtor is notified and summoned to appear within 10 days. The debtor's only defences are payment of the debt or invalidity of the title. One or more hearings may take place if defences are raised. Once the judgment has been affirmed on appeal (or in the event the debtor fails to file a defence or appeal), the mortgaged or pledged assets are appraised (unless this was waived in the agreement) and following the appraisal, the title deeds to the assets are demanded from the debtor (mortgages and vehicles only), and finally the assets are auctioned at a public bid. The lender may appear at said auction and bid against the lender's unpaid credit. For registered pledges, judicial enforcement applies unless the parties expressly agree upon an extrajudicial enforcement, in which case there is no need for attachment of the assets; the creditor sells the assets directly. According to the Reorganisation Act No. 18,387 (the Act) there are two types of reorganisation or bankruptcy procedure: voluntary reorganisation (when the debtor acts upon its own insolvency) or necessary reorganisation (when the same is requested by any creditor or by the debtor but its assets amount to less than its liabilities). The first stage is an automatic stay of all enforcement procedures (including automatic stays of the enforcement of secured credits by means of pledges or mortgages for 120 days) during which a reorganisation procedure is negotiated; if not, the court will order the sale of the company's ongoing concerns as a whole, or if this scenario fails (no bidding is made) the company's assets are sold in parts. The Act also calls for a private reorganisation agreement in which the debtor and 75 per cent of the creditors may enter a reorganisation agreement (this does not affect secured creditors, who may pursue the recovery of their debts by enforcing their pledges or mortgages). The Act provides that once bankruptcy has been declared, no creditor may initiate enforcement procedures against the debtor; however, in the case of credits guaranteed by pledges or mortgages, this prohibition (automatic stay) will terminate 120 days after the declaration of bankruptcy, in which case enforcement must be sought from the bankruptcy judge. Further, contractual provisions that declare agreements automatically terminated or enable any party to terminate the agreement in cases of insolvency or declaration of bankruptcy shall be null and void. Termination in a non-Uruguayan currency is permitted. Upon the declaration of bankruptcy, however, the insolvent party's unsecured obligations shall be automatically converted into Uruguayan pesos at the exchange rate applicable on the date the bankruptcy was declared. Obligations secured by pledges or mortgages must be collected in the original currency, up to the amount of the security. 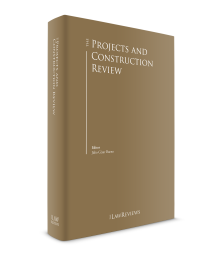 classification of the project by DINAMA as category A, B or C. DINAMA has 10 business days to confirm or correct the classification proposed by the holder of the project. An environmental classification certificate is issued and communicated to the applicable competent authority. A project is classified as category A if its execution has a non-significant negative environmental impact, category B if its execution has a moderate negative environmental impact, whose effects may be easily eliminated or minimised, or category C if it may cause significant negative environmental impact, whether or not preventive or mitigation measures are included. If the project is classified as category A, the AAP is granted with no need for any further steps. Parties whose projects have been classified as category B or C need to carry out an EIA at their own cost and file a request for the AAP with DINAMA. Details of the project (except for information deemed to be of a commercially or industrially confidential nature) and the EIA are then made available to interested parties for comments for 20 business days. A public hearing follows if the project has been classified as C or if DINAMA believes that the project will have a significant cultural, social or environmental impact. Finally, DINAMA issues a resolution stating whether the AAP has been granted. The AAP will only be granted if the project is considered to cause only acceptable residual negative effects. Also, DINAMA may grant the AAP subject to the introduction of amendments to the project or the adoption of preventive or mitigating measures deemed necessary. The AAP will be valid for a term determined by DINAMA. Application of the Equator Principles is not common practice in Uruguay. In principle, under Uruguayan law, financial institutions have no administrative, civil or criminal liabilities when participating as lenders in a project finance transaction. social infrastructure, including prisons, health centres, educational centres, public housing, sports centres and urban projects (improvement, equipment and development works). Contracting of educational, health or security services is expressly forbidden, as are contracting services relating to the rehabilitation of prisoners, and the implementation of educational and health centres or prisons. The exploitation of monopolies is also excluded. The PPP Law expressly sets out the principles that PPP contracts should follow, including: transparency and publicity, public interest, economic efficiency, proper distribution of risks, transfer of assets to the government when required, equanimity, temporality (not more than 35 years), fiscal responsibility, control, sustainable growth and regard for labour conditions. It further defines the 'economic efficiency principle', stating that the value-for-money concept includes the reduction of costs, risk levels and availability. other contractor obligations such as the presentation of audited financial statements. The contractor may assume different forms and be paid by the users, the administration or both. Compensation and retention rights in favour of the administration for the implementation of penalties under the PPP contract are granted. It also provides that the administration will be able to receive certain income whether from the contractor or users. Furthermore, it is stated that the administration will be able to give minimum revenue guarantees, but it is not allowed to ensure profits or levels of returns. When required, the executive should grant some of these contributions. The contracting procedure as regulated in the PPP Law is divided into different stages. A contract can be initiated ex officio by the administration, or by a private initiative submitted by a proponent. The administration should receive the assessment document referring to the feasibility and suitability of the project concerned. Based on the characteristics of each project, the subsequent initial evaluation will be based on the pre-feasibility, feasibility and impact studies. These studies will be presented to the Planning and Budget Office and the Ministry of Economy and Finance for their consideration and the preparation of reports. The proponent of a private initiative (which must be submitted to the National Development Corporation) will have certain rights and preferences: it can obtain the reimbursement of certain costs incurred in feasibility studies if it is not awarded the contract, and can also obtain an advantage of up to 10 per cent of its offer with respect to the best offer; the promoter of the initiative will not pay for the terms and conditions of the bid documents. All the information regarding a private initiative is confidential. Once reports from the relevant bodies have been obtained, the contracting administration can start the competitive dialogue, which is one the most innovative aspects of the PPP system and consists of a debate held between the administration and the interested entities that fulfil the technical and economic solvency requirements. This allows the parties to discuss all the relevant aspects of the PPP contract and define the special terms and conditions. This phase is essential for the private sector to be able to introduce modifications or adjustments. After the competitive dialogue and notification to participants, the administration will call for the submission of offers. The call can only be directed to those that have participated in the competitive dialogue. However, if only one party participates, other interested entities should be admitted. The call should also state whether the participants in the competitive dialogue will receive any preference or compensation. Upon the completion of the stages and approvals mentioned in the PPP Law, and the institution of the relevant guarantees, the administration will award the PPP contract and execute the relevant agreements according to the terms and conditions discussed during the competitive dialogue. The general public bidding law of Uruguay is set out in the Coordinated Text of the State Accounting and Financial Management Law (TOCAF), which states that tender procedures shall be ruled by the following principles: publicity, so that the largest number of competitors can be attracted; equal treatment of bidders, and impartiality of the public administration; and stability, resulting from strict compliance with all applicable rules and regulations. Other general principles include flexibility, materiality and truthfulness. Under TOCAF, however, preference may be given to national products provided they are of the same quality as foreign ones. In public work contracts, preference may be given to offers that imply a larger use of domestic raw materials and labour. Administrative acts in bidding procedures or public work contracts may be challenged before the Court of Administrative Litigation, the body in charge of annulling or maintaining all administrative acts. Under the legal regime in force, the submission of a request for review in some cases has an automatic suspensive effect on the act being challenged, unless the administration, by a duly grounded decision, declares that said suspension would affect urgent needs of service or would cause serious damage. The Uruguayan authorities encourage all investment, without discrimination between local and foreign investors; incentives for investments are available for both. Furthermore, and under the Investment Law, the remittance of profits and repatriation of capital are guaranteed. Specific restrictions on ownership do apply to foreign nationals, however, regarding certain industries such as aeronautics, the maritime industry and the media. The tax system does not discriminate against nor favour foreign investment. However, the tax burden is influenced by the legal vehicle adopted to perform activities in Uruguay. Further, there is a general system for promoting industrial activities (along with special promotion systems for specific activities and sectors such as fishing, merchant marine, national aviation and hydrocarbons, with varying benefits). technological research geared to exploitation of non-exploited local raw materials, training of technicians and workers. National interest status implies promotional benefits in terms of credits (to buy assets, cover establishment expenses, imports, raw materials, etc.) and in terms of taxes (total or partial exemption from taxes, assessments, contributions and rates or public prices, as well as total or partial exemption from taxes and duties on imports or in connection with imports). With the exception of certain generic benefits regarding imports of equipment, all other tax benefits must be requested by the interested parties and must be expressly granted or recognised by the authorities in each case. Under Regulatory Decree 455/007, provision is made for a direct income tax exoneration based on two parameters: the project scale (determined according to the invested amount) and the 'score' obtained by the project, which will be determined on the basis of a matrix of objectives determined by the executive. The Uruguayan exchange market operates under complete freedom of transaction and holdings in currency and metals; there are no exchange control laws in force. Similarly, there is total freedom regarding transfers and remittances to and from the country in any currency. In principle, there are no restrictions, controls or fees on remittances of investment returns or loan payments to parties in other jurisdictions, but taxes do apply. In the case of dividend distributions from Uruguayan corporations to non-resident entities without permanent establishment in Uruguay, a tax rate of 7 per cent applies on the amount of results distributed that constitute taxable income subject to corporate income tax. If a reduction in the paid-in capital was resolved, and the capital was repaid to the shareholder, the 7 per cent rate will also apply to the amount that exceeds the face value of shares of Uruguayan corporations, as this payment will be assimilated to a dividend distribution and will be treated equally. Payments of capital under loans are not taxable; payment of interest to non-resident entities without permanent establishment in Uruguay will, however, be taxable at a rate of 12 per cent. There are no specific courts or tribunals in Uruguay dealing with project finance transactions or constructions contracts. A foreign investor will not need to establish a place of business or be permanently domiciled in the country to appear before a court or arbitration committee; however, it is compulsory to establish a 'special domicile' in Uruguay for the purpose of serving any notices, court papers or writs within any procedure. Although judicial proceedings are still the primary manner in which disputes are settled, ADR is widespread. The fact that courts are overburdened and judicial proceedings are time-consuming contributes to the success of ADR, the costs of which, however, are substantially higher. Mediation bodies are created by the Supreme Court of Justice. Parties consenting to mediate discuss their issues and are encouraged to arrive at an agreement by the mediating bodies, which do not issue decisions or have power to impose them upon the parties. Mediation is generally limited to small claims. Conciliation constitutes the most popular form of ADR. It entails one or more hearings before a judge to attempt settlement and is provided for by the General Code of Procedure (GCP), which determines that a party willing to take legal action must first engage in conciliation. Conciliation is also compulsory during proceedings at the first hearing. If the parties settle, any such agreements are binding upon the parties and directly enforceable. Arbitration is laid down by the GCP, which includes thorough procedural regulations that apply in the absence of determination thereof by the parties. In principle, arbitration is decided in equity, but parties may agree that the arbitrators apply statutory law. All disputes – including project finance and construction disputes – can be resolved through arbitration, with the sole exception of matters that cannot be settled by the parties (namely criminal matters, family law and proceedings involving rights that cannot be waived or public policy). Usually, parties to arbitration will agree to resolve their disputes according to the Arbitration Regulation of the Conciliation and Arbitration Centre, International Court of Arbitration for MERCOSUR, of the Uruguayan Stock Exchange, or even submit their disputes to the Court. In complex commercial agreements, parties also resort to international arbitral institutions such as the International Chamber of Commerce. Uruguay is signatory to a number of international treaties regarding arbitration and enforcement of arbitral awards. In the absence of a treaty, the rules of enforcement of foreign judgments also apply to foreign arbitral awards (the procedure for recognition and enforcement can take between 12 and 18 months). Further, Uruguay is party to the New York Convention on the Recognition and Enforcement of Foreign Arbitral Awards. Uruguay must take advantage of the great interest that foreign investors are showing by identifying and promoting the opportunities it has to offer. Construction of infrastructure (improvement of roads in particular) is needed to accompany economic growth and the development that various industries are experiencing. This is reflected in UPM's request for the country's railway system (which is currently practically non-existent) to be updated and the subsequent call for bid for the Central Railway Project, launched by the government. The PPP Law could finally be used by the government to foster infrastructure projects. The national policies on large-scale mining will have to be clearly stated and the LSM Law should be correctly regulated. Acknowledging the growth that the renewable energy industry is experiencing, regulations should be passed so that Law No. 18,362 on wind farm easements can be applied, and legislation should be drafted to address the 'wake effect'. Finally, although it is still not clear whether Uruguay has oil resources, it is imperative that a new, updated and coherent national policy on hydrocarbons is adopted, for the sustainable development of the oil industry and the protection of all other sectors of the economy. 1 Beatriz Spiess is a partner at Guyer & Regules. 2 Multilateral Investment Guarantee Agency (MIGA) guarantees have been granted in the past.